"[Gauthier's] career as a recording artist was as unconventional as her life....In 1917, she began a series for Victor, but these were made, under the cheap black label, for the Canadian trade, and never listed in the general U.S. catalog….The Victor recordings are consistently good; the voice is lovely and well forward and she sings with obvious relish." "After graduating from the Paris Conservatoire, Yvonne Gall made her début as a Rhinemaiden in a performance of LE CRÉPUSCULE DES DIEUX (GÖTTERDÄMMERUNG) at the Opéra-Comique in 1908. Her first leading role was Mathilde in Rossini’s GUILLAUME TELL opposite Léon Escalaïs. She took part in a number of novelties. She sang in Bachelt’s SCEMO in 1914, in Magnard’s GUERCOEUR opposite Marthe Chenal and Maria Kuznetsova. It was not until after the war that she became a principal at the Opéra-Comique. Her first appearance was as Marguerite. In due course she sang, Manon, Antonia, Tosca, Louise, Donna Anna, Juliette and Daphne in Busser’s LES NOCES CORINTHIENNES. In 1918 she was invited to the Teatro Colón at Buenos Aires, where she was heard as Thaïs, Juliette and Salomé in Massenet’s HÉRODIADE. She made her début at the Chicago Opera as Thaïs the same year. There, she was called to undertake whatever the great Diva Mary Garden was unwilling or unable to sing. She was very successful in the first American performance of Ravel’s L’HEURE ESPAGNOLE. She greatly pleased as Tosca, Manon, Salomé and Mathilde. The remarkable Russian impresario Raoul Gunsbourg brought her to Monte Carlo for THAÏS, a French TRISTAN with Paul Franz and Ariane in Dukas’s ARIANE ET BARBE-BLEU. Gall made Pathé and Columbia recordings. Hers is a bright sounding lyric soprano voice of a typically 'gallic' sound and full of dramatic energy." “The leading French mezzo of her generation, Blanche Deschamps made her 1879 début in Brussels singing in the operetta GIROFLÉ-GIROFLA, soon followed by her operatic début at the Monnaie as Mignon. There, she was associated with two important creations: Herodias in Massenet’s HÉRODIADE (1881) and Uta in Reyer’s SIGURD (1884). Her creator parts at the Paris Opéra-Comique, where she sang beginning in 1885, included principal mezzo/contralto roles in Lalo’s LE ROI D’YS (1888), Massenet’s CENDRILLON (1899) and Charpentier’s LOUISE (1900). As a member of the Paris Opéra beginning in 1891, she appeared in many major roles: Azucena, Amneris, Fricka, and Brangäne, and most notably, the Paris Opéra’s first Dalila in SAMSON ET DALILA (1892), a role she sang on many other stages. That same year, she appeared as Fidès in the Paris Opéra’s revival of LE PROPHÈTE, and the following year, sang at the Meyerbeer centenary concert. Much of her career was centered in Monte Carlo where her husband, Léon Jehin, was for many years the house conductor. Her first role there was Maddelena in RIGOLETTO in 1889. Soon thereafter, she took on more important roles, such as Carmen, Léonore in LA FAVORITE, Margared in LE ROI D’YS, and the Queen in HAMLET, opposite Nellie Melba in 1890. Also at Monte Carlo, Deschamps-Jehin was the first woman to sing the trouser role of Pygmalion in Victor Massé’s GALATHÉE, as the composer had originally intended it. "[In the above], hear one of the miracles of singing snatched by the early gramophone. In the folksong ‘Ma Lisette’, Calvé makes her famous leap up to a high, pianissimo D that is one of those notes from what she called her 'fourth voice'. She had learned the technique, she claimed, from Domenico Mustafa, one of the last of the Papal castrati. What is remarkable about the note is its fullness despite its quietness." “…in coming up to the final high note [above], Calvé had a small but noticeable disaster….This time Calvé's performance was still more intense. There was more dancing, and then the final phrase...emerged precisely as it had done before. 'Ah, Mon Dieu!' exclaimed Calvé through her teeth, and these words were also recorded. After that, they gave up on Carmen." 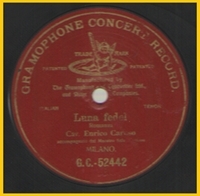 "In 1906, Mme Marchesi made some records for the HMV Company in Berlin; the matrices were destroyed the same year in submission to an ultimatum of Nellie Melba - a dark chapter in the story of recorded song....Then, after a lapse of thirty years, Mme Marchesi returned to the HMV Studios to make three records, already historic....The records which [she] has recently made in London represent the first major triumph of the record collectors....There is thus preserved for us the most important link in that chain which constitutes the history of recent song, a chain that leads back through the grandure of the Golden Age directly to Manuel Garcia." “Tariol-Baugé began her career at the Grand Théâtre in Bordeaux. Here she appeared in CARMEN, MIGNON, WERTHER and FAUST. She made guest appearances in Russia and began to appear with great success in operettas. She toured through the French provinces and North Africa. She made her début at the Nouveau Théâtre in Paris in Suppé’s BOCCACCIO and had a sensational success. After her appearance at the Théâtre Eldorado in Paris, she became the big star of the Théâtre des Bouffes Parisiens. Here she took over in the premieres of operettes. Her career reached its climax when she created the role of Agathe in Messager’s VÉRONIQUE at Théâtre des Bouffes Parisiens, Paris, on 10 December 1898, then the part of Fiorella in Offenbach’s LES BRIGANDS in 1900 at the Théâtre des Variétés in Paris. In 1925 she sang at the Opéra-Comique in Paris in its première of VÉRONIQUE (together with her son, André). “Yvonne George was discovered by Paul Frank, director of Olympia, during a stay in Belgium. She made her début in Paris on 8 October 1920. Acclaimed rather quickly by the intellectual milieu of Montparnasse, she was nicknamed ‘The Muse of Montparnasse’, but throughout her career she had to fight to win. It must be said that she was a true tragedian and an interpreter of marine folklore, but in addition to fighting for her talent, Yvonne George was constantly fighting for her own life; this excessive woman lived in alcohol, cocaine, and opium. Yvonne George was the first great love of poet Robert Desnos. She was the star for which he wrote some of his best poems. He was completely crazy about her, even going so far as to get drugs to make sure that his beloved lacked nothing. Desnos desperately tried to get closer to the Star he so loved by following her in her artificial universe but in vain ... her love was never shared. Robert Desnos declared ‘Yvonne George expresses with all her gestures, her attitude, her very existence; she was not a woman,but a flame. She was better than intelligent: sensitive, more than beautiful and moving. The modern woman, so long calumniated by fools, found in her her highest expression’." "Friant's repertoire was large and varied....He also took part in the premieres of numerous French operas which have long since fallen into obscurity. Perhaps his most admired role was Jean in Massenet's LE JONGLEUR DE NOTRE-DAME in which he impressed with his dancing and juggling, as well as his vocal skills. He was clearly a reliable as well as versatile artist." J0573. CHARLES FRIANT & GERMAINE CERNAY, w. Cloëz Cond. : WERTHER – Mort de Werther, 3s / Sd. 4 = GERMAINE CERNAY, w. Cloëz Cond. : MIGNON – Elle est aimée. 2–12” French Odéon 123.585/86, only form of issue, 24 Nov., 1928. M-A MB 35, the Pair. "Who better to represent the old school than Pol Plançon with his instrumental-like legato line and a coloratura technique to put many a soprano to shame?"